Wednesday May 1, St. Jude Memphis Marathon Weekend 2013!! Woohoo!!! Registration for the St. Jude Memphis Marathon Weekend is now open for Heroes!! And yes, we're having Team Ingram once again this year!! Go to www.stjudemarathon.org (link is below) to sign up as a HERO for either the 5K, Half-Marathon, or Full Marathon and start raising money for St Jude to continue finding cures for cancer and other catastrophic diseases. We would love to have as many Team Ingram members as possible, so click TEAM and type in Team Ingram to join us!! We will have a big team party at the end of the summer to celebrate and talk about all the logistics so go ahead and "GET YOUR MOVE ON!!!" Oh Yeah...Can't Wait Till This Weekend! Tuesday April 30th, Official Report: CLEAR! 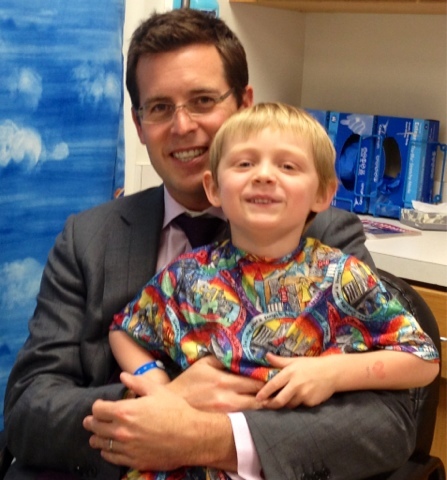 And the official reading from the best children's Brain Tumor Oncologist and the most well known Ependymoma doctor said that Ingram's scan was clear! You could say that we at the Dismuke house are just a little bit excited and relieved. For some reason, both of us were a little more nervous about this scan than the others; I'm sure it was the timing of everything with it all hitting around the anniversaries for each stage in Ingram's treatment. We also know that Ingram's cancer is an aggressive one that has recurred in many other Ependymoma patients that we know. We also know that every time he has a headache or throws up or gets sick, we will always think to ourselves "Is it back?" and send ourselves into a little bit of panic because cancer is our reality now. Dr. Gajjar gave us the official news this morning and then we went started discussing Ingram's port removal which is a huge deal. His port has been used ever since April 25th, 2012 to draw his labs, give him sleepy medicine, antibiotics, blood transfusions, platelet transfusions, but most importantly his chemo drugs. We're kind of attached to it, but ready to move on to the next stage in Ingram's journey. 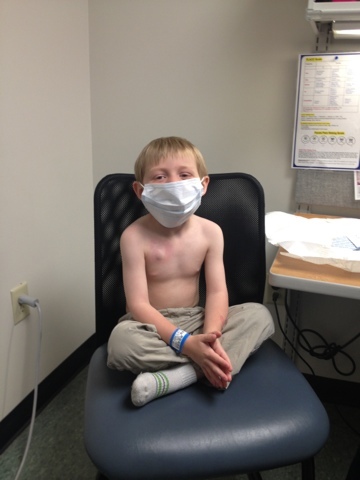 We'll be getting it out in about a month after Ingram completes a 21-day course of antibiotics for a pretty severe sinus infection; we thought it was just allergies, but the MRI showed otherwise and Ingram has never complained about any symptoms. They said he was a tough cookie which we knew already! After we left St. Jude, we stopped by Oak Hall to sign up for the 26th Annual Oak Hall Run For St. Jude! They still have space for many more runners and are taking registrations even on race day. The race itself is this Sunday, May 5th at 3pm with Race Day Registration starting at noon. Our whole crew will be running in the race and we look forward to Ingram saying "Get Your Move On!" right before Danny's Dream Team blows the horn to start the race. It should be a beautiful day outside and a very family friendly event to raise money for St. Jude. Once again..."Scans Are Clear! Scans Are Clear!" Shark Face...In Case You Haven't Seen It In A While! Monday April 29th, Scan Day! Our day started early at St. Jude but even before Ingram had his poke, the girls had their own excitement at school. Our local news station, WMCTV Channel 5, was at our school waiting to see everyone "Going Green" for Ingram and the girls. Ben Watson and his crew toured Dogwood and interviewed Madison, Lindsey, and Mrs. Berry (Lindsey's teacher) and also got lots of the students and faculty wearing their green and signing banners for Ingram. Ingram was his regular comical self and had fun all day long...even getting poked and getting his sleepy medicine was an adventure in laughter. When he woke up in the recovery room, he was as drunk as a skunk and it was taking us forever to figure out what he was saying! He was making everyone laugh and even tried to get us to let him walk out of the recovery room when he couldn't even sit up in his bed. Once we had him to where he could be strapped in his seat belt, we headed home to see the girls since it was such a big day for everyone. The news story aired on the Action News 5 tonight and made waiting on Ingram's test results a little easier! Seeing our girls surrounded by green and kids of all ages signing posters for Ingram was just what our hearts needed. We unexpectedly received the unofficial results tonight stating that there were no tumor cells present in Ingram's spinal fluid or on his MRI!!! We will receive the official results when we meet with our doctor tomorrow and review all the results and also discuss our next plan. Our whole family appreciates all the prayers, messages, phone calls, and emails that have been coming our way especially today. Our Doctors are great! Ingram is a stud! Madison and Lindsey are awesome! But God is totally and overwhelmingly full of Grace! The above link goes directly to the article/video from the news crew at the best school ever...Dogwood Elementary School! Bring It On Nurse Lisa! You're Looking At 38 Pounds Of Pure Bravery! Yeah, You Know We Look Good! Apparently Someone Can't Stand Up By Himself! April 27th and 28th Saturday and Sunday, Water Anyone? Lucky for us, all the girls slept till after 8am and woke up to the announcement "DONUTS!" They all came running down the steps ready for breakfast and almost trampled Lindsey along the way. She was like a deer caught in the headlights and froze when they all started down the steps towards the kitchen. Ingram was already in the den and barely looked away from his cartoon to tell them all good morning as they came running for the donuts. The only better way to wake up after around 4 hours of sleep was to jump back in the pool and go swimming again; since their time got cut short last night, they were extra excited to have some more pool time before they had to head home. With all the fun they had, I think Madison's idea of having a "phone bucket" for everyone to keep their phones, iPods, iPads just might have been one of the smartest decisions she had made! 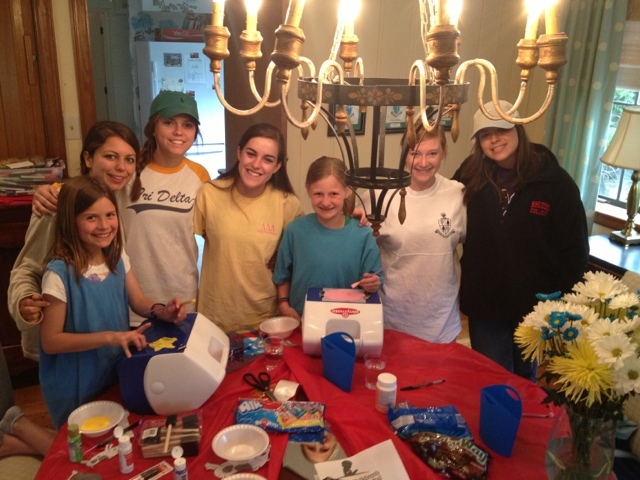 A few of the Rhodes College Tri Deltas had invited the girls to come out to do some art projects with them and they were so excited; my girls vowed not to get grouchy due to their lack of sleep but you never know when the grouchies will kick in so I made sure to warn the Rhodes girls. I didn't get to stay very long because Madison and Lindsey kicked me out, but they painted some really cool designs and pictures on some coolers with all the girls. They even had Airheads, Milky Ways, Oreos, and Milk for snacks while they got their creativity on with the girls! Once Madison got back, she was pretty much worthless for the rest of the day, but then again, if I get less than four hours of sleep, I'd be worthless too! 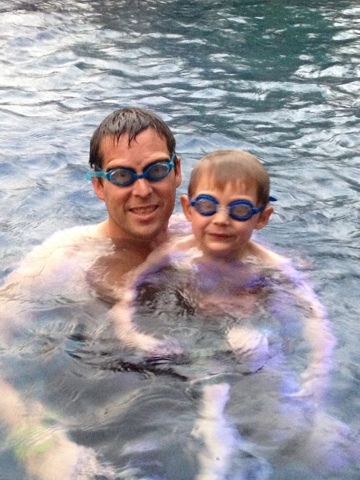 Ingram however was in energizer bunny mode and was dying to get back in the pool and swim. Since Lindsey was at a friends house, Daddy got in the pool with him and they swam and jumped and swam and jumped for a long time. Ingram started out with his floatie on, but then we let him take it off and show Daddy all that he had learned at swimming lessons. That joker swam all over the pool with no fear!!! He'd launch from the steps to Daddy in the shallow end, jump off the board and swim to him in the middle of the deep end, and even jump off the wall and swim to Daddy. I believe he has picked swimming up much faster than the girls, but now we're nervous because he thinks he can swim better than he actually can. Hopefully the pool alarm won't bother our neighbors too much when it starts going off, because that puppy's going back in the pool...just in case! Sunday morning, we had the honor of speaking in one of the Sunday School classes at our church and I must say, Craig did a great job. I've lived out our story for the past year, but have never heard Craig speak like he did today. Even though I knew what's coming in our story, I had tears rolling down my cheeks several times. Madison and Ingram even came in at the end when they were out of their classes and got to meet some of the men and women who had been praying for us for so long...all the way back to Craig's heart surgery in 2007. We spent the rest of the afternoon goofing off at home since soccer practice and T-ball practice were cancelled and of course went swimming again; we can't believe how long we put off getting a pool because I'm pretty sure we could swim in it every day! With the emotions already in full teary mode from this morning, we spent the rest of the day and late into the night hanging out and swimming in the pool again before the kids had to go to bed. Since tomorrow is a big day with Ingram's MRI and Spinal Tap, we let the kids sleep together and had an extra sweet time with all of us piled in Madison's bed singing "Jesus" (technically it's Jesus Loves Me) and saying prayers; even Beau got to crawl into the bed with us and laid down. 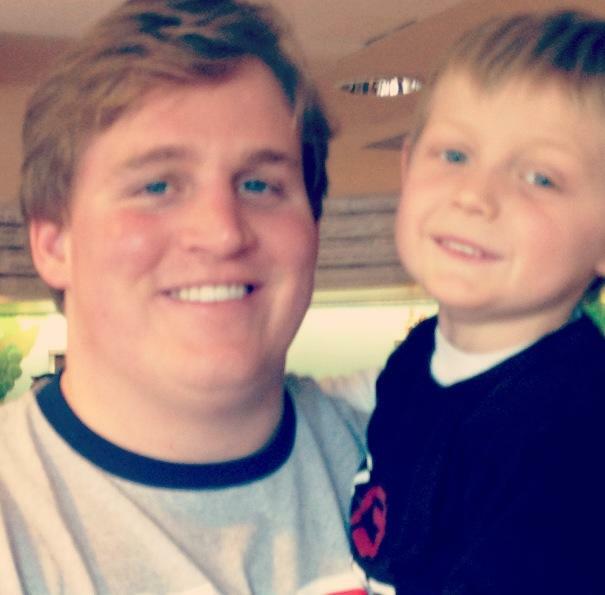 Please pray for us as we go through the range of emotions that happen during scans. It's the only time that you are waiting on the words from the doctor telling you if there is cancer in your child's body or not at that given moment. We all call the emotions "Scanxiety" and joke about it, but it truly is a roller coaster all in one day with several ups and down. Also pray for all of the children with cancer and their families because it is a long hard road and we all need extra prayers at any given moment. We were lifted up this morning prayer from "The Encouragers" and want all of our fellow angels, warriors, and their families to feel the same encouragement that we felt. Beautiful Girls Even With Less Than 4 Hours Of Sleep! With Claire, Mary Kate, Morgan, Danielle, And Carrie! Daddy And Ingy Poo Making Some Waves Saturday Afternoon! 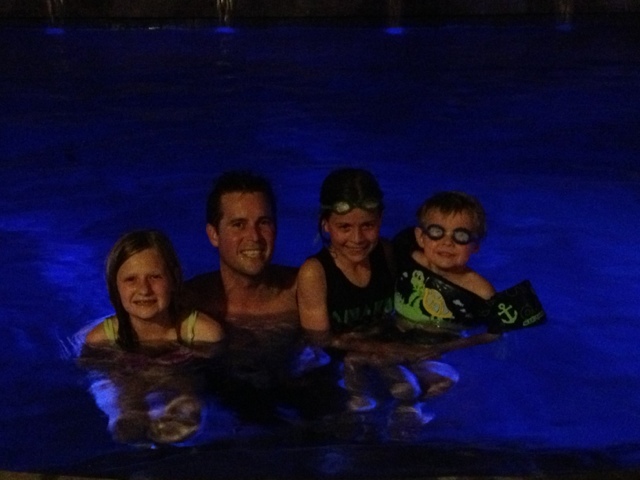 Nothing Like Swimming At 9pm On A School Night!! At Least They're Done With Their TCAPS! Thursday and Friday April 25th and 26th, Oh No...They're Back!!! The weather is crazy here, warm one day and cool the next, but the pool heater has been turned on in anticipation for its invasion...by 11 year old girls this weekend!! But we "needed" to check it out just to make sure it was working properly so the kids all hopped in Thursday after school just to make sure it was getting warm enough. Who could blame them? 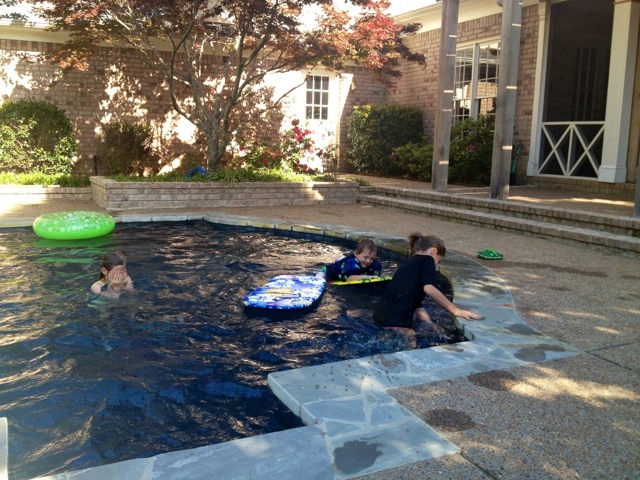 The pool was just calling their names AND we didn't have anything else to do sports wise for the evening. Ingram was already is his swim suit from his last swimming lesson and he tricked the girls and headed straight for the pool while he told them he was just putting his towel out to dry. They quickly figured it out and ran 100 fast to get their suits on and join him for the fun. We finished the night with dinner and watched the NFL draft as St. Jude patient Markell announced his favorite teams' first round pick. Friday morning, the girls made a special announcement over the intercom system with friends to remind everyone about "Go Green Monday" and they loved it! 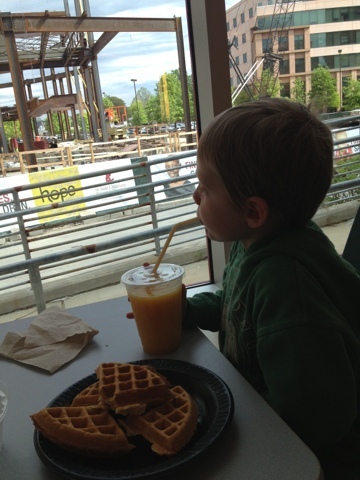 Ingram had a fun morning too and had his favorite St. Jude breakfast, waffles and orange juice, before he went to his Speech appointment. Daddy was on the road for work and oddly enough had the same breakfast as Ingram; let's just hope he didn't have the same cowlick as Ingram or that might be bad for business. Ingram wanted to see how much he had grown so we stopped in the lab and hopped on the scale; 38.06 pounds puts him in the heavyweight category!!! We finished up at St. Jude by having lunch and helping out in the Coca Cola "What Makes You Happy?" video booth before we headed home to rescue Beau from the rain. Friday night at the dinner table, I could hardly hear myself think! 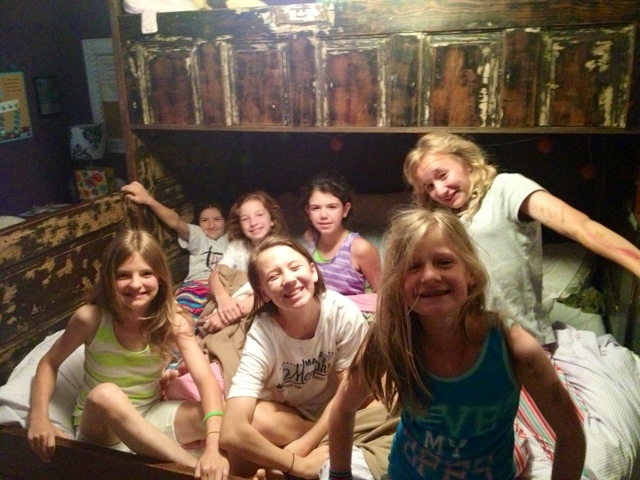 I had forgotten how loud a bunch of elementary school girls are since we haven't had a group of only girls at the house like this since Madison's birthday last year this same time. They were all so sweet, but were so bummed out when I made then jump out of the water when we saw the first lightning (even though it was forever away)! 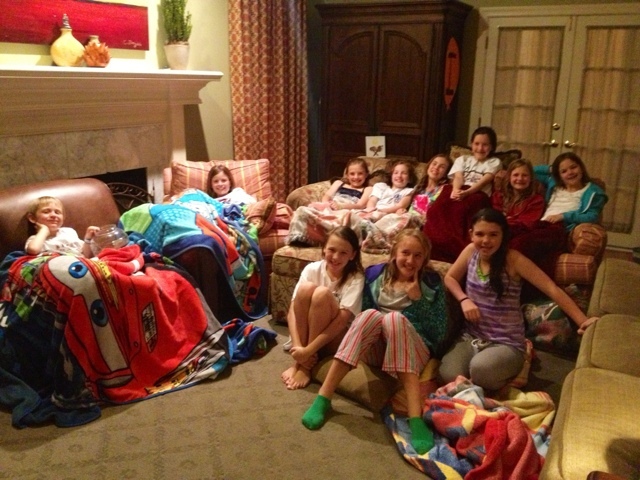 Once they calmed down from dinner, we all piled in the den to watch The Odd Life Of Timothy Green and even Beau got invited to join the party as he cuddled with the girls during part of the movie. I wish I could say that the girls remembered the "sleep" part of a "sleepover" but they weren't quite ready to settle down and go to sleep until 4:15am when the last one fell down for the count. But They Managed To Have Fun! Guess I Got To Start Combing His Hair Before We Go Places! Haven't Done That In Over A Year!! Breakfast Of Champions...Or At Least My Two! I Love Having Our House Full Of Friends And Laughter! In honor of our school "GOING GREEN!" on Monday April 29th for Ingram's scans, we've added a new shirt to the CONQUER Shop and updated the inventory for the regular shirts. We have the original green Team Ingram shirt, the grey CONQUER shirt in short sleeves and a few long sleeves, but have added a super cool running shirt! You've probably seen pictures of them through the blog the last few weeks, because one of us wears one just about every day! We're taking these running shirts for a "test run" so we only bought a few of each size; you may want to purchase them while they're in stock (there's only 10)! You can access the Shop through the picture of the CONQUER shirt on the top right of the blog or you can go directly to the website at www.kidsconqueringcancer.com and then to the "shop" icon on the screen. We also have a few upcoming events in the works to raise money for St. Jude and will release details once we know them. Of course, if you want to donate to St. Jude without waiting on an event or a shirt order, we would love to help with that too so let us know! Madison Is Wearing The Grey CONQUER Shirt! Lindsey Is Wearing The New Green Running Shirt! Ingram Is Wearing The Original Team Ingram Shirt! "Get Your Move On!" And Order A Shirt If You Don't Have One Already! 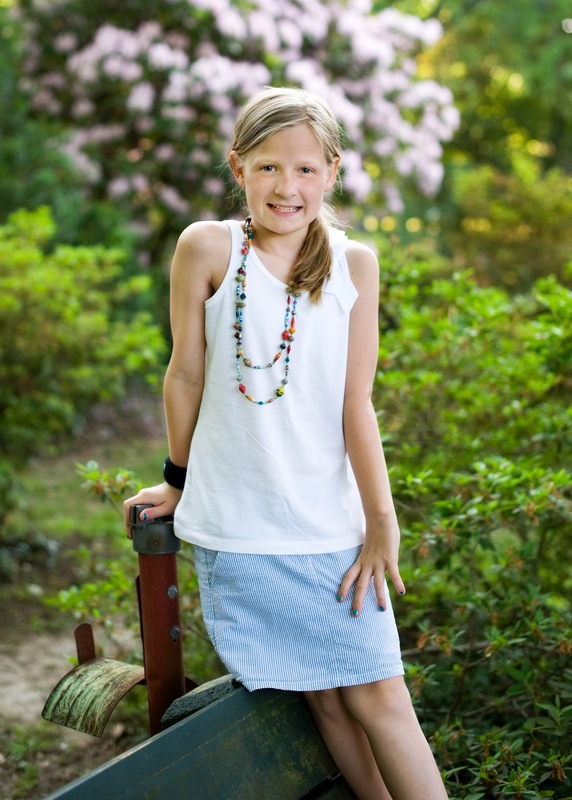 Wednesday April 24th, Happy 11th Birthday Madison! Well, today's a big day in the Dismuke house, but it's not because of Ingram...today is all about Madison the Compassionate! She's officially 11 years old now and we can't be more proud of the young lady she's becoming. Who would have thought that as a 9 year old (3 weeks shy of her 10th birthday) she could make a decision that would impact so many people?? When Ingram was diagnosed with cancer, she stepped up and was determined to help him and all the other kids in the world that have cancer by raising money for St. Jude in his honor. Her decision didn't fade at all and she's determined to continue to raise money for St. Jude in hopes of finding a cure for cancer. Daddy named her correctly when he dubbed her Madison the Compassionate several years ago and we're sitting back and watching how God continues to direct her compassionate heart. We celebrated this morning by singing Happy Birthday as all three of them climbed into my bed; the only thing missing was Daddy, but he was already at work. At school, Ingram helped me bring Madison lunch and cookies for her class to celebrate her birthday despite it being TCAP week. Once they were home from school and Daddy was home from work, it was time to get our party on! Madison picked Russo's for her birthday dinner but was even more excited to come back home for presents and cookie cake! Lindsey decorated her cookie cake with the candles and even lit them; we all sang Happy Birthday in our best "crazy" voices as she blew out the candles and made her wish. The kids are all nuts and their eyes are about 100 times bigger than their stomachs and each wanted a whole word from Madison's cake, even though they only ate one bite off of their pieces! I don't think the sugar had any time to kick in because Ingram was asleep in his bed minutes later and had no idea that the girls were going to sleep together (and keep celebrating in Madison's bed....shhhh, they think we don't know how late they stayed up) in honor of our new "big day" tradition. We also found out while we were at school that their whole school is "Going Green!" for the girls on Monday April 29th since Ingram is having his MRI and Spinal Tap that day. We thought it was just going to be Lindsey's class, but it turns out it's going to be the whole school and the girls are sooooo excited about it! It means so much to them that all of their friends are "in it with them" to an extent. We love our schools so much and are so excited that they can support our girls and Ingram in such a tangible way; it just melts this Mommy's heart! Looking Good In The Dismuke Birthday Hat! While We Waited For Madison's Class To Get To Lunch! She Ate Maybe Two Bites Of It! But She Doesn't Have To Worry About Someone Taking It...It's Labeled Already! Monday and Tuesday April 22nd and 23rd, Starting To Slow Down A Little? It was so nice to wake up Monday morning and not have to go anywhere other than taking the girls to school. We drove them part of the way and they finished walking since their school was celebrating Earth Day by walking or biking to school. We came back home and snuggled up in the chair and watched cartoons and played all day long while the girls had to take their TCAP tests at school. The girls had soccer practice after school and then we headed home for showers and an attempt at an early bedtime; I guess 9pm was early compared to this weekend right? Craig was invited to go to Union University (our old college) to a Bible Study to share Ingram's story to over 200 fraternity and sorority students which was super cool, even if he did get home close to midnight! Tuesday morning, we drove the girls to school again and then headed to Ingram's school. I had to go to the grocery store then back to his school; he's a picky lunch eater and over the weekend, he and Lindsey ate all the chicken in the house and they neglected to tell me when I went to the grocery on Monday...so I had to go again for chicken. At least now we have chicken and everyone is happy again! Lindsey had a game and Madison had practice, but Ingram had to finish coloring some Make-A-Wish artwork before he could go to the game. We eventually made it to Lindsey's game, but Ingram was more interested in throwing the football and tennis ball with Daddy than watching Lindsey play soccer. I guess he felt he put in his fair share of cheerling this weekend during 4 games for Lindsey. Of course, he also ended up with a few bad throws and Daddy had to run onto the soccer field and retrieve the balls before the girls ran down the field. Oh the craziness of my men!!! Ingram is doing great other than battling his allergies STILL, and we're staying busy trying not to think or worry about his MRI and Spinal Tap coming up next week. With Ependymoma Awareness Day being last week and Brain Tumor Awareness Month being May, there's more than the average amount of thinking and talking going on about cancer and brain tumors at our house. 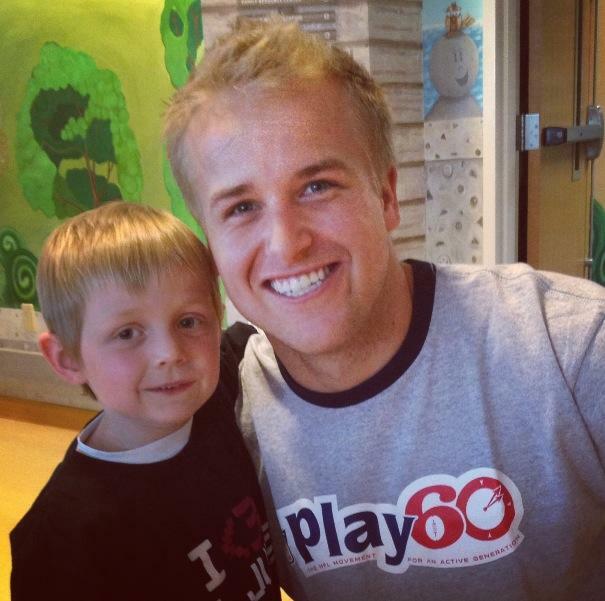 Something that was exciting and cheered us up came from Mr. David and we were all surprised to hear it...Outkick The Coverage, an online sports magazine, posted an article titled "St. Jude Cancer Patient To Announce First Round of NFL Draft Pick" to announce the NFL's new youth fitness campaign NFL Play 60! The great thing about this is it's based from Friday's visit to St. Jude by Barrett Jones and Matt Barkley when Ingram was there with some other patients. A picture of Ingram throwing the football to Matt Barkley even made it into the article. The article also talks about the hospital so now even more people might become aware of the work SJ is doing and that's great news for everyone, especially us! So Love These Red Cheeks! Move Over...Mommy's Coming To Watch Cartoons Too! The above is the link to the online magazine article. The video clips that were made at St. Jude should air Thursday night during the draft!! Saturday and Sunday April 20th and 21st, The Most Fun Weekend Ever! While we were in Nashville having a fun girl weekend, Daddy had lots of stuff to do with the little two! Lindsey had a soccer tournament the entire weekend and Ingram had baseball stuff too. Both days consisted of running back and forth between the soccer fields and the baseball fields with 4 soccer games, one baseball game, and one baseball practice. Lindsey's team made it to the final round after playing 3 outstanding games, and ended up with silver medals. They were so excited and proud of themselves because this was their first medal and they played great the whole time. They also had red hair paint and all sprayed their hair for the tournament so they were really the "red" team! Ingram's baseball game was on Saturday in between Lindsey's two games and so that made it interesting for Craig getting them to the right spots at the right time. Ingram of course had a blast at his game and hit the ball "super hard" and ran "super fast" to all the bases. Saturday night Daddy took Ingram, Lindsey, and Olivia and Jacinta Sullivan to Russo's for dinner and it was quite entertaining! After their dinner and dropping off the Sullivan's at their house, Daddy put Lindsey and Ingram in bed in Madison's room since they begged to sleep in her bed. He went to check on them before he was going to bed and ended up crawling in bed with them and sleeping for the rest of the night because they just looked too cute snuggled up in the corner of Madison's bed. Our Saturday consisted of sleeping in late then heading to the "fake" Parthenon as Madison called it; she has read all sorts of books about Greek Mythology and really enjoyed seeing the Parthenon and especially Athena. She was so silly and started acting out the different poses of all the statues we came across of the Greek gods and goddesses. Next we headed to another part of Nashville and met the McNally's for lunch! Ingram was a little jealous that he didn't get to see Mae, but we gave them all hugs from him. Madison and Lucy tried to listen to our (mine and Tricia) conversations the while time while Mae and Winn acted like the craziest cutest little sisters on the block! They also told us about some cute shops to go to and Madison ended up getting a few new things as an early birthday present; I think this was the first time she didn't complain about going shopping! We headed towards the Capitol and got there just in time to check out the Military Museum, the Tennessee War Memorial, and Capitol Hill before we had to head back towards our hotel. We even both rolled down "capitol hill" and got way more dizzy than on the Harry Potter roller coasters that we rode at Disney. I don't remember feeling sick after rolling down hills when I was little, but then again, this particular hill was huge and steep and I'm a lot older now! After a last stop for dinner and a few stores at Opry Mills, we headed to our hotel, went swimming, then went to bed close to 11pm again. Sunday morning came very early for Craig and the kids, but not us! They had to be on the soccer field bright and early and were playing Lindsey's first game before we even were awake. By the time Lindsey was in her final game, we were just getting out of our hotel and making our plans for the rest of the day and our trip home. Our friends, the Rookers and the Holsingers, came over to the house and hung out with Craig and the kids before Lindsey's final game. I heard that they even talked Craig into letting Lindsey and the kids eat ice cream at home before Lindsey headed to her game (sorry about that Coach Penny!). The only bad thing about that was that Beau somehow got into the ice cream when they were in the other room and got busted on top of the counter while he was eating out of the bowl. I'm not sure what happened, but all I know is that there's one less ice cream bowl in the cabinet and it sounds like Beau might have gotten a spanking! While Daddy was in total control of the chaos at home, we ate lunch at California Pizza Kitchen and then stopped at Sweet CeCe's for ice cream before we headed back towards home. We made a detour in Jackson to see Granny (my grandmother), but Grandmother (Craig's grandmother) had already gone back to church by the time we made it to Jackson. Mimi and Aunt Amye were there too and gave Madison her birthday presents early. We hopped back in the car and flew home because we missed Daddy, Lindsey, Ingram, and even Beau! Our weekend was great with just the two of us, but it sure was nice to get home and get hugs and kisses from the others too. Neither of us felt like cooking dinner so we headed to El Mezcal and TCBY for dinner and ice cream before all five of us passed out from exhaustion! The thing about our three kids, and I'm sure everyone else's kids too, is that they love getting alone time with us, especially getting alone time with one of us, but it's next to impossible to do. Madison was so sweet and never complained about not getting to go on her Double Digit trip last year because of Ingram's cancer so finally getting to go our weekend away was very special. It wasn't about just getting away to get away, it was about the fact that Ingram was healthy enough for an over protective mother and an over protective big sister to leave town for a couple days. The crazy thing about being at ECS on Friday is that I saw how much Madison had physically grown up from Kindergarten (there as still a picture of her on their wall), but she has also emotionally grown up from cancer; for how difficult that has been on her as the oldest child and as the biggest sister, this weekend she was just Madison, the birthday girl, getting lots of extra overdue attention. Lindsey is already asking about her trip and all the things she wants to do when it's her turn. Even Ingram was talking about going on his trip when he gets bigger like his girls, but he couldn't decide if he wanted to go with just Mommy, just Daddy, or both of us. It's special moments like this weekend that temporarily take us away from our new reality that make me so grateful for my new reality, for my three kids, for my husband, and for everyone else that is part of our reality. Madison And Her Gal Athena! Lunch With The McNally Girls! Ingram Just After He Hit Saturday! Action Shot...Lindsey (number 8) Scoring A Goal! Madison Once Again Immitating The Statues...This Time It's Andrew Jackson! Saturday Night Dinner At Russo's! Yes That Would Be Lindsey Biting Her Medal To See If It's Real Silver! It Sounds Like Something Daddy Would Have Done! Those Crazy Girls With Red Hair!! Way To Go U10 Germantown Legends! Ingram Wanted To Have A Picture With His Medal Too! He Got One For The Best Cheerleader For The Soccer Weekend! Visiting Granny On Our Way Home! Madison's Teachers Would Be Proud...Doing Homework On The Way Home From Nashville! I Know, We Celebrate Everything With Ice Cream! So Glad To Be Home With The Whole Family! Thursday and Friday April 18th and 19th, The Fun Keeps Coming! Our whole house overslept Thursday morning because of our super late night at the Grizzlies game! Madison and Lindsey managed to get to school on time while Ingram made it in time for Wheel Day at GBC. The girls loved their Wheel Day when they were Ingram's age and Ingram was so excited about his very first Wheel Day! He had so much fun with his friends and riding their bikes around the parking lot and then celebrated with Snow Cones in the grass. 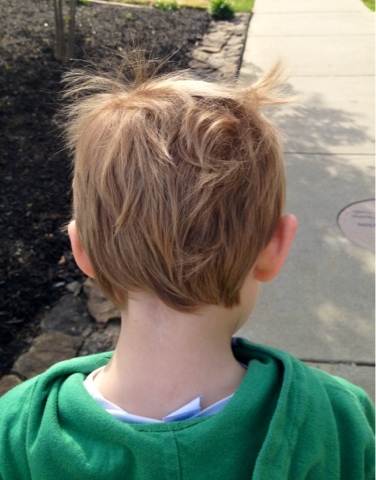 It was a beautiful morning for his bike riding but that soon changed as storms rolled into town after Ingram's swimming lessons and cancelled the girls' soccer games and also Ingram's T-Ball game. We were all relieved because with Daddy still traveling back home, it was going to be tricky being three places at one! We decided to have rainy day fun inside (after a quick trip to the Vera Bradley store courtesy of some sweet friends) and made cats, dogs, and fish out of little plastic pieces that you iron to melt. I had forgotten how fun those little things can be until the kids dragged them out of the cabinet. While they were working on them, Daddy snuck in the back door and then snuck into the den and scared them all; it was great and they were so glad he was back in town. My hopes of an early bedtime to catch them up on their sleep was spoiled, but trying to catch up with everything they were saying was a pretty good trade off. It was cold Friday morning, but not to cold to stop the ECS Bike-A-Thon for St. Jude! We got to go into Mrs. Taylor's Kindergarten class and talk to all the kids about Ingram's cancer and St. Jude; more importantly, Ingram told them about two of his favorite things at St. Jude...Painting and Grilled Cheese sandwiches! All the kids went to their bikes next and Ingram was the leader of the whole first lap around the school; it was a big lap, but he managed to make it all the way around and was still smiling at the end of his lap, but was a little cold. We headed back into Mrs. Taylor's room, which was also Madison's room when she was in Kindergarten, and Ingram played with the Lego's and warmed up. We had more fun with the kids when they got finished riding but then had to leave so they could go back to learning. After our lunch, Ingram went with me to "kidnap" Madison from school so that I could take her on her "Double Digits" Birthday Trip; we were supposed to go last April when she turned 10, but it was the weekend after Ingram got diagnosed with cancer. She was totally surprised and was so excited that "her weekend" was finally going to happen! 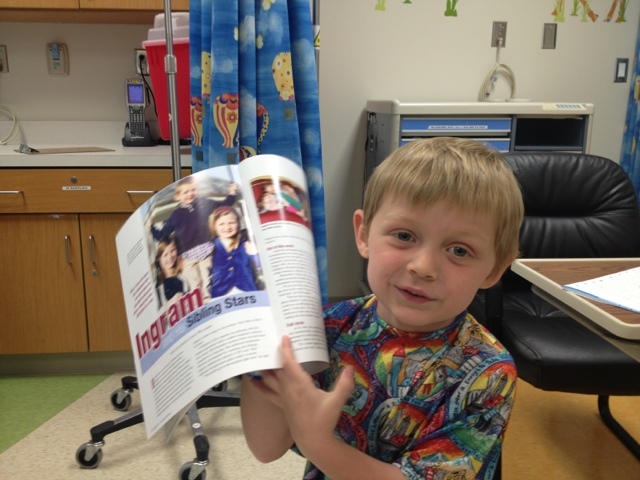 We also got to see Lindsey's class during the day and they had worn their "Ingram" shirts today for Ingram. We just love our school Dogwood!! 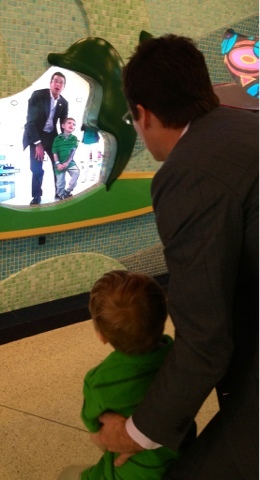 We dropped Ingram off with Daddy and they headed to St. Jude for a special afternoon. Barrett Jones from Alabama and Matt Barkley from Southern Cal were at St. Jude making a video for the NFL and Ingram and the other kids got to have fun painting and throwing the football with the guys. With everything that Ingram and Craig have said about the afternoon, the video should be pretty fun to watch on NFL Draft Day! While they were making the video, Lindsey was still at school and we were in Jackson eating ice cream with Aunt Amye, Carley, and Brett on our way to Nashville. Once they were finished at SJ, Daddy and Ingram left to pick up Lindsey and her friend Elizabeth and played the rest of the night at home while Elizabeth's brother had a baseball game. In Nashville, we weren't quite ready for bed yet and had lots of fun exploring the Opryland Hotel and even went on a boat ride in a river inside the hotel! With a great start to our trip, we were bound to have a great time away while Daddy took care of Ingram, Lindsey, and Beau. Ingram's Own Pair Of Blue Goggles To Go With His Blue Ear Plugs! Approaching The Final Turn And These Sweet Kids Are Still Following Behind Ingram! More Fun At The Bike-A-Thon! Ingram With Mrs. Taylor, Madison's Kindergarten Teacher! Playing Lego's In The Kindergarten Class! I'm Not Quite Sure I'm Ready For This...Good Thing We've Got Another Whole Year! 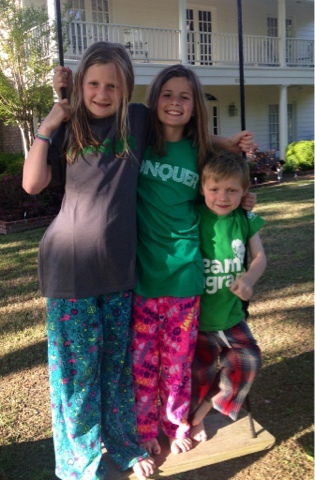 Mrs. Berry's Bullfrogs Went Green Again For Ingram! Ice Cream Surprise With The Cousins! Madison With Brett And Carley! Madison Watching The Water Show After Our Boat Ride! Doing Facetime With Daddy To Tell Him Everything We've Done So Far...At 11pm! Saturday and Sunday March 30th and 31st, Easter! Friday March 29th, Good Friday!